The first story tells of a firefighter and his girlfriend named Su-Jung who works in a TV station as a news translator for the mute. She’s waiting for him to propose, focused on the rationale that given his dangerous job, she likes the idea of him having to think of her, to hesitate for a while before jumping into danger. He, on the other hand, is waiting for that perfect opportunity, setting and all, before popping the question. The second story is about a deaf girl who works as a costume character in a theme park. There she meets a young artist who she begins to develop feelings for quickly; yet refuses to take off her mask in front of him for quite some time. The third story is of a mother and child. The mother was too busy to spend time with her young son, until an illness confines her to a hospital bed. There the mother and son begin to communicate more and more. Lastly, the story of a boy and girl who have just broken up. The girl’s reason being that she needs a more stable guy with a good job. The unemployed ex-boyfriend goes off and finds himself a job helping other couples break up. Hoping that if he earns enough money, he could woo his loved one back. The film was a relative success, with just over a million admissions in South Korea. 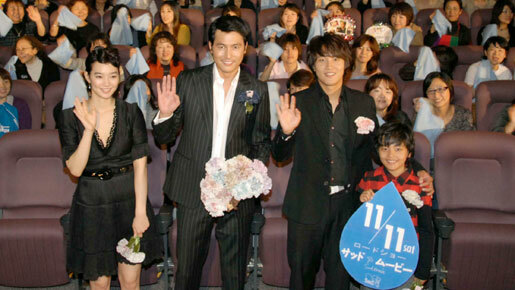 It also received a strong showing in Japan, mostly thanks to the popularity of lead actor Jung Woo-sung. Esta película nos muestra la vida de cuatro parejas muy diferentes. Un bombero treintañero esta buscando la pedida de mano perfecta para su novia. Un chico que no ha conseguido trabajo desde largo tiempo y cuya novia ya esta cansada de esa situación. Un niño de 8 años que echa de menos desesperadamente a su ocupada madre. Y por último, una chica sordo-muda (Shin Min Ah) con una terrible quemadura en su cara que se enamora de un pintor. Jung Woo-Sung (as Jin-Woo), Im Su-Jung (as Su-Jung), Cha Tae-Hyun (as Ha-Seok), Yeom Jung-Ah (as Ju-Yung), Shin Min-Ah (as Su-Eun), Son Tae-Yung (as Suk-Hyun), and Lee Ki-Woo (as Sang-Gyu). Sad Movie is an ensemble korean film that have -like its own name says- so many sad stories. Shin Min Ah stars in this film as Su Eun, a deaf girl who works in an amusement park covering her face with a costume due to her scar. 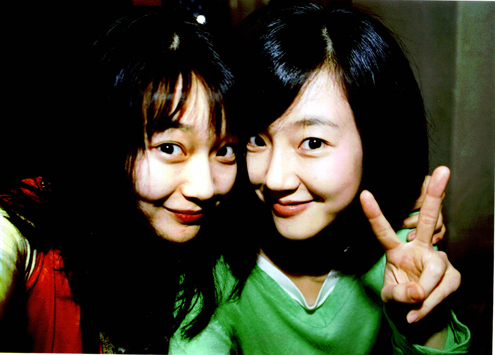 Su Eun lives with her older sister (Im Su-Jung) who has a boyfriend who is a handsome firefighter (Jung Woo-Sung)that loves Su Eun like her own sister. Minah’s character falls in love with a painter who works in the amusement park played by Lee Ki Woo. – who also starred with Minah korean drama ‘A Love to kill’. MinAh develops a beautiful emotional character. Just hearing her thoughts, looking her, her tears and smile you can feel everything that she wants to say, beautiful and sad feelings. It’s very difficult develop a character when you can’t say any words, just using body language and hearing her thoughts -like they are her word- but Minah did a great job that make us love Su Eun! So enjoy this movie!…. Its a good, emotional and sweet film filled of great performances, OST, good direction and a wonderful plot with beautiful stories that you’ll love. MinAh desarrolla un personaje precioso y emotivo, que solo escuchando sus pensamientos, viendo su mirada, sus lágrimas, su sonrisa, te emociona y te llena de sentimientos preciosos y tristes a la vez. Es muy difícil interpretar un papel en el cual no dices una palabra, solo con su expresividad y los pensamientos del personaje (recordemos que es sordo-muda y esto representa como si fueran sus palabras). Disfruten de la película, sepan que van a ver una película triste, pero llena de sentimientos, buenas interpretaciones, con una imagen muy cuidada y un desarrollo precioso de la trama aunque sean diferentes historias. A todo ello le acompaña una música muy bonita que hace que esta película te emocione aún más.